.. examining 2014 characteristics of areas with population 20,000 and over .. this section summarizes how to use the America Community Survey (ACS2014) “supplemental” data (ACS2014S) to access more current estimates than otherwise available. The America Community Survey “supplemental” data are just that, a supplemental set of ACS 2014 1-year estimates — for areas 20,000 population and over. See the related Web section providing more detail. The importance of the ACS 2014S data are two fold. 1 – 2014 1-year estimates for a larger number of areas than available from the ACS 2014 1-year (ACS2014) estimates. 2 – more current (2014) data for those areas only available from the 5-year estimates (centric to 2012) that are between 20,000 and 65,000 population. The ten cities/places with the highest 2014 median family income based on 1-year estimates were all under 65,000 population. These cities were not included in the ACS 2014 1-year standard estimates but were included in the ACS 2014 1-year supplemental estimates. See list below. 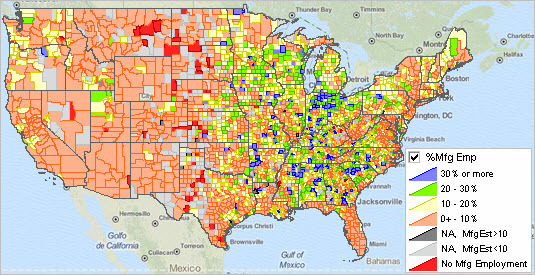 This section provides an overview of the ACS 2014 supplemental data and provides a summary of tools, interactive table and GIS project, to analyze characteristics of these areas. These data are used by ProximityOne to develop/update annual county demographic-economic projections. See schedule of related 2016 updates. As shown in the table below, 2014 1-year “supplemental” estimates are available for more than twice as many counties from the ACS2014S compared to the ACS2014 “standard” 1-year estimates. However, there area a more limited set of subject matter data available from the ACS2014S data compared to both the ACS 2014 1-year and 5-year estimates. The following graphic shows the additional counties for which ACS 2014 1-year estimates are available using the “supplemental” data. Click graphic for larger view; expand browser window for best quality view. The larger view shows metropolitan area (MSA) boundaries. Note that for example, ACS 2014 1 year data are available for all counties in the Austin and San Antonio metros (see pointer) — previously unavailable.. The ACS 2014 supplemental data include 42 tables and a total of 229 data items. Br> The table number and descriptions are summarized below. The interactive table contains all geography for which the ACS2014S data have been tabulated for these geographies: U.S., state, county, city/place, 114th Congressional District, MSA/MISA, PUMA, urban area and school district. The table provides access to key selected items. The following graphic illustrates use of the interactive table. First cities/places were selected using the Type drop-down below the table. Next, the table is ranked in descending order on median family income. As shown in the graphic the largest 10 cities/places were under 65,000 population. Click graphic for larger view.